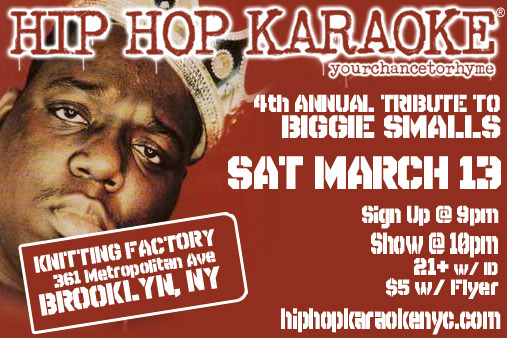 Hip Hop Karaoke NYC :: Blog: Saturday, March 13th. williamsburg. the likelihood of me physically harming someone at this show just quintupled. All ya heard was "Charlie don't hit me no more." heehee. i keed i keed of course. i'm trying to remember - does mr beatz currently hold the biggie crown? I pity fool that Charlie gonna hit. naw - was some hot female MC from D.C. took it down last year. I was robbed. Even though I wasn't eligible... I was still robbed. And then four days later I broke my wrist. i would also like some more information on emo backgrounds.